Lammas, Lughnasa, Lughnasadh--whatever you call it* or however you spell it, August 1st is a super-awesome holiday. It's what is referred to as a "first fruits" festival, meaning it kicks off the beginning of the harvest. In some parts of the Britain and Ireland, it's referred to as "Bilberry Day" and marks the first day of bilberry season. I don't have any bilberries, but I do have their American cousin, the blueberry. 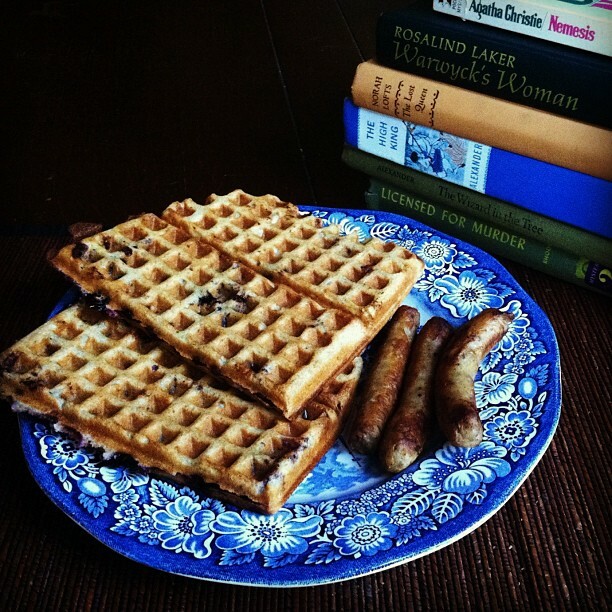 To incorporate both the wheat harvest aspect of Lughnasadh and Bilberry Day, I've made Blueberry Sourdough Waffles. Yummy yummy yummy.